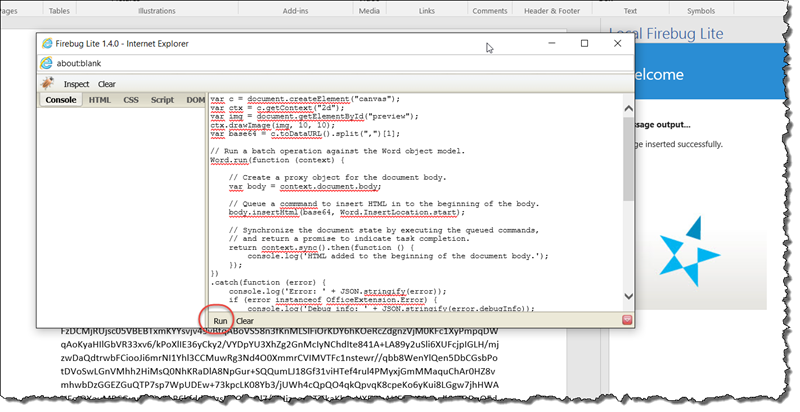 In this article I will demonstrate how to convert a web based image, displayed in an Add-In, into a base64 encoded string. With that I will then insert it into a Word document, directly from the Add-In. 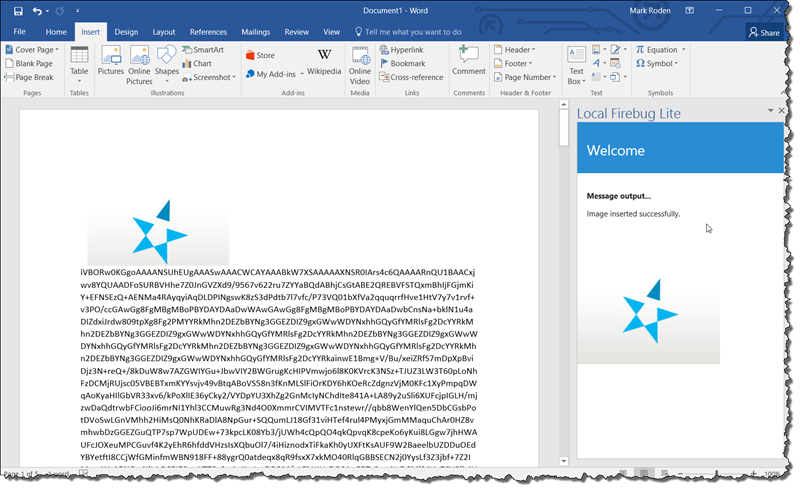 In the previous article I showed how to manually insertInlinePictureFromBase64 an image into a Word 2016 document. In this article I will demonstrate how to convert and existing web based image into base64 encoded string and then insert it. Using the HTML5 canvas element we can easily convert an image to base64 using the canvas.toDataURL() method. The following code is a simple example of how to get an image from within the Add-In, convert it and insert it. The canvas.toDataURL() method will trigger a Security Alert if the image is not hosted in the same domain as the Add-In. // Run a batch operation against the Word object model. // Create a proxy object for the document body. // Queue a commmand to insert HTML in to the beginning of the body. // and return a promise to indicate task completion. // Queue a command to insert the image. As we can see from the image below – the image and text are inserted. There is 4 pages of text for what was originally a 6KB (SIX) image. This is not a very quick process.